Nineveh is not a Jewish city, but the name is familiar to most Jewish children. In the book of the prophet Jonah, which we read as the haftorah of the minchah service of Yom Kippur, Nineveh is the center of interest. 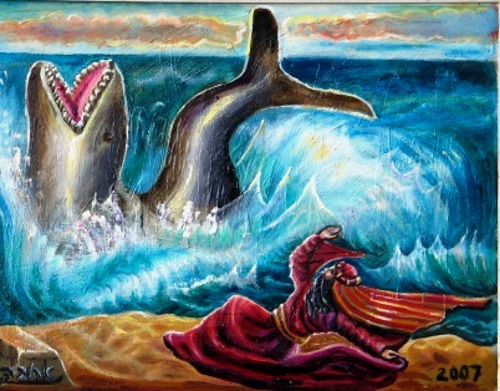 The story of the Book of Jonah is well known, and we need not dwell on it. The interest of this story is centered on "teshuvah" (repentance), and the lesson it teaches us is a very timely one on the occasion of the Day of Atonement. About a hundred years ago, if a boy asked the teacher during a lesson on the Book of Jonah, or Nachum, or Zephaniah (for all three Prophets mention this city), "Where is Nineveh? Can one visit the city nowadays?" the teacher would have had to answer, "We know very little about the location of the city." Today, however, we are more fortunate. For in the past hundred years explorers of antiquity have excavated much of the once beautiful and powerful capital of the great Assyrian Empire. To get to Nineveh nowadays is not difficult. All we have to do is to start from Haifa, in the Land of Israel, and simply follow the famous oil pipeline all the way to Mosul, in Iraq. There, across the Tigris River, on the left bank, opposite Mosul, lie the ruins of the once proud city of Nineveh. Nineveh was one of the first cities ever built. chumash tells us that it was built by king Nimrod (also called Ashur), the father of the Assyrian people. That was in the time of Abraham. It must have grown steadily, and it became the capital of the Assyrian Empire, about three thousand years ago. Under the powerful Assyrian kings the city was enlarged and beautified. Sargon built a strong wall around Nineveh, including and uniting it with three other cities. It was this enlarged city that the Prophet Jonah speaks of as a city of "three days' journey." Under Sennacherib the city was further enlarged and beautified. Sennacherib built great palaces in it. One of the castles he built, and which was only excavated partially, contained as many as seventy-one large, and beautifully decorated rooms. Sennacherib also erected arsenals for military purposes, strengthened the forts which guarded every part of the long walls. He provided the city with a most astonishing aqueduct that provided water for the city through eighteen separate channels from the hills. In the center of the city, Sennacherib, who must have had an unusual understanding of city planning, planted the "Paradise," a huge park in which grew trees, plants and flowers of the entire world. Around these "Botanical Gardens" no one was permitted to build houses or workshops. Ashurbanipal vied with Sennacherib in making Nineveh the jewel-city of the east. Most important of his constructions is the greatest library of old, which was recently excavated, and in which were found tens of thousands of clay tablets containing the entire Babylonian and most of the world's literature. The excellent order and care of the library is astonishing. At the time of Jonah, Nineveh was a center of immorality and depravity. One can easily understand the Prophet Jonah when he refused to step into this humming, elegant world capital to tell the people that they should do "teshuvah," repentance, otherwise they would be destroyed. And one can even better understand the surprise of the prophet that his words had made an impression upon the proud inhabitants of the Assyrian metropolis. For the inhabitants of Nineveh, from king to slave, changed their evil ways and returned to the ways of G‑d, regretting deeply, with sackcloth and ashes upon their heads, their previous mode of living. This was truly an event which the world was not destined to see again throughout history. But the short period of repentance in the days of Jonah passed, and Nineveh returned to its wicked ways. The end of Nineveh was inevitable, as Nachum and Zephaniah predicted: "The doom of Nineveh, the city of blood. It is full of lies and robbery; never cease preying… O’ king of Assyria, there is no healing for thy breach; fatal is thy wound: all that hear the report of thee will clap their hands over thee, for over whom did not thy wickedness pass continually!" About the year 612 before the Common Era, the city was besieged by the Babylonians and Medes, and destroyed completely, never again to be inhabited. The mighty Assyrian Empire, which had destroyed the Northern Kingdom of Israel, met with its retribution. Nineveh was wiped off the face of the earth, and its ruins can serve as an eloquent commentary on what happens to all the proud and mighty. Sounds very degrading towards Assyrians and why don't you call the Hanging Garden's of Babylon by its name? for it is one of the worlds 7 wonders. We are not wiped away fromt he earth as I would not be able to write this commentary. We do inhabit the Ninveh plains in Iraq.